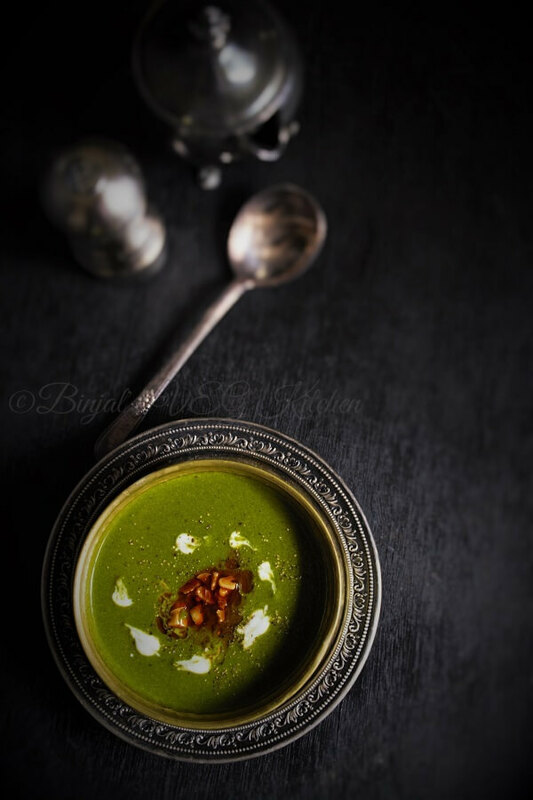 Palak Shorba or Spinach Shorba is similar like spinach soup with Indian spice touch up. Palak Shorba is mostly commonly found in Central Asia and Middle East, even serve in almost all Asian restaurant before meal. Shorba is one of various kind of soup or stew like simply gravy. Originally shorba is a Mughlai cuisine recipe, but you can also call it Punjabi or north Indian recipe. 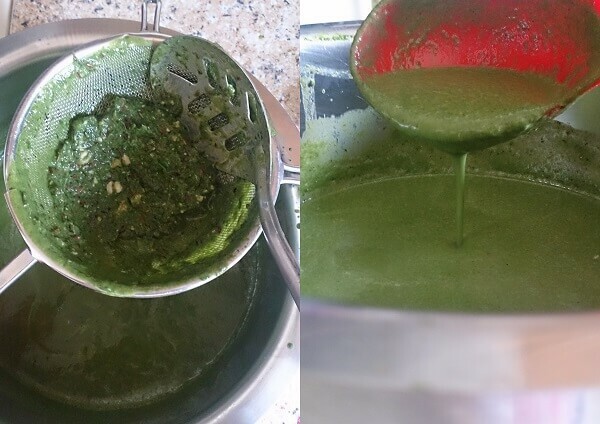 Palak shorba is rich in taste and very delicious with lots of nutrition. Palak or spinach is full of nutritional goodness and can make any dish attractive by giving it a lovely bright green color. 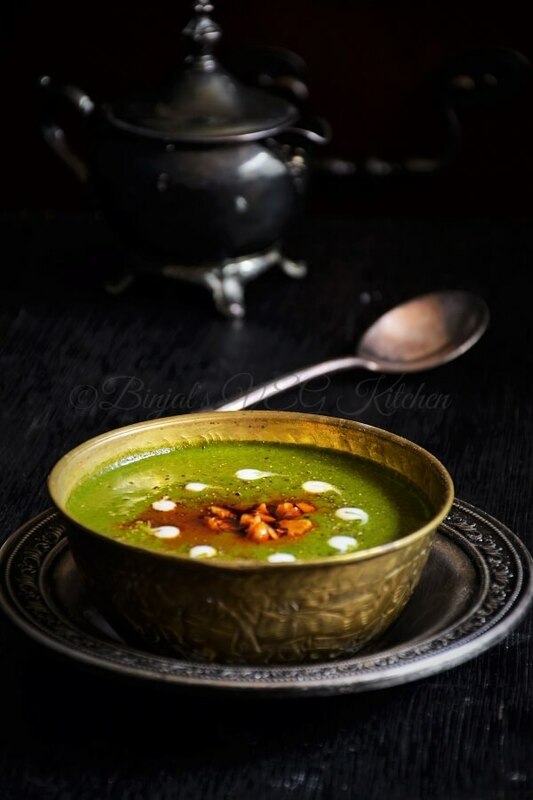 A typical Indian meal starts with traditionally-flavored soups like tomato soup or shorba and this palak shorba is one of them. 1. Wash and remove the stems of spinach leaves, chop it roughly and keep aside. 2. Heat oil/ghee in a pan. 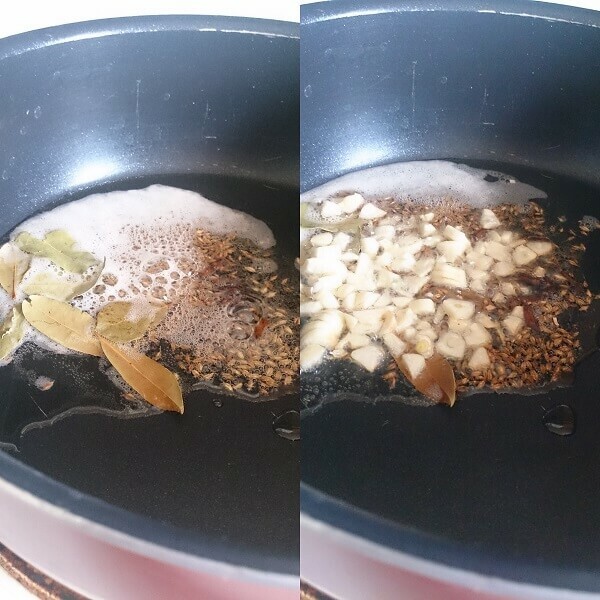 Add cumin seeds, bay leaves, cloves, cinnamon and sauté for few seconds. 3. Add finely minced garlic and fry till golden color. 4. Add chopped onion, sauté for few minutes till golden brown or translucent. 5. Add chopped spinach, red chili powder, garam masala, ginger paste, salt and mix well till soften. 6. 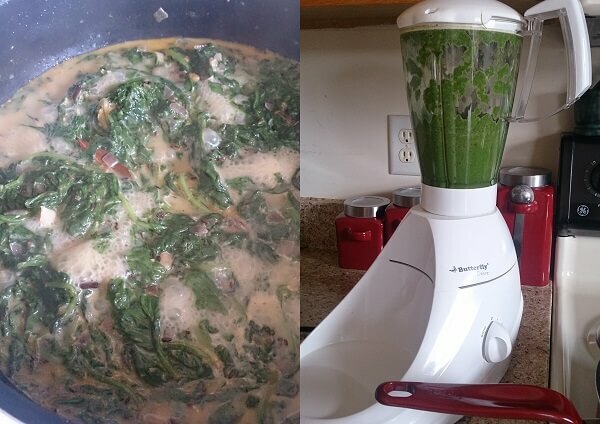 Once spinach become soften; add milk and bring it to the boiling point. 7. Switch of the flame, cover it and let it them little cool down. 8. Add prepared mixture into a blender. Add fresh mint leaves, green chili and blend it well, make the smooth puree. 9. Take same pan, pass the puree through a sieve so that the small remains of the strand get removed. 10. Boil it again; add water or milk as per your choice or how thick or thin consistency you want. 11. Now heat ghee in the small tempering pan. Add chopped garlic, fry it till golden, and then add pinch of red chili powder, cook it for few seconds, and tempered over the Palak Shorba. 12. Remove it from the flame, serve it in the soup bowl, garnish with dash of cream, or sprinkle some black pepper powder as per your choice. 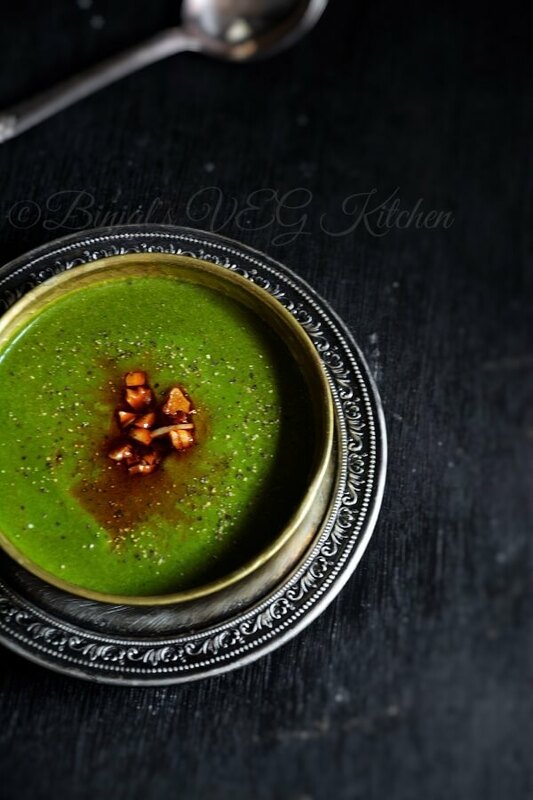 • You can add the almond milk instead of milk for vegan Palak Shorba. • You can add other veggies too with palak like bottle guard, carrot, etc. Wash and remove the stems of spinach leaves, chop it roughly and keep aside. Heat oil/ghee in a pan. Add cumin seeds, bay leaves, cloves, cinnamon and sauté for few seconds. Add finely minced garlic and fry till golden color. Add chopped onion, sauté for few minutes till golden brown or translucent. 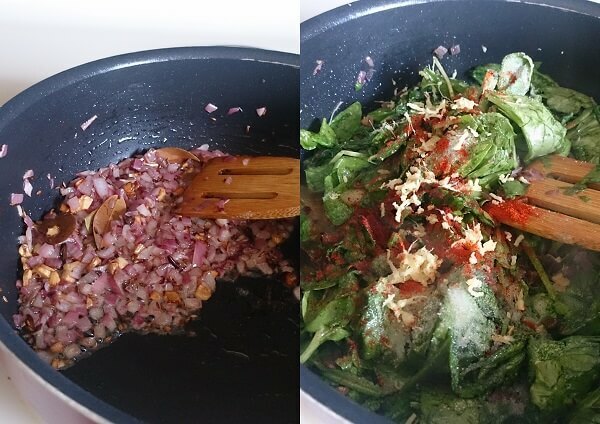 Add chopped spinach, red chili powder, garam masala, ginger paste, salt and mix well till soften. 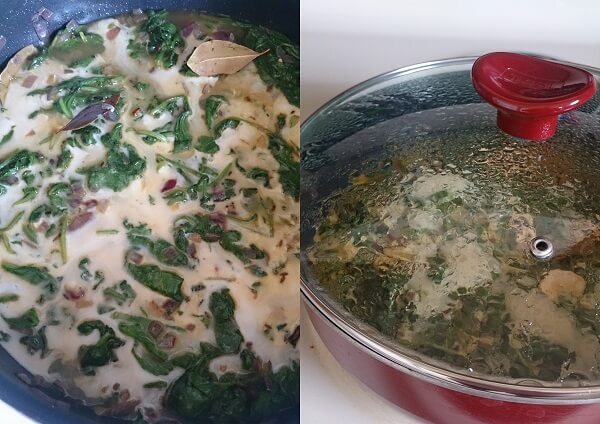 Once spinach become soften; add milk and bring it to the boiling point. Switch of the flame, cover it and let it them little cool down. Add prepared mixture into a blender. Add fresh mint leaves, green chili and blend it well, make the smooth puree. Take same pan, pass the puree through a sieve so that the small remains of the strand get removed. Boil it again; add water or milk as per your choice or how thick or thin consistency you want. Now heat ghee in the small tempering pan. Add chopped garlic, fry it till golden, and then add pinch of red chili powder, cook it for few seconds, and tempered over the Palak Shorba. Remove it from the flame, serve it in the soup bowl, garnish with dash of cream, or sprinkle some black pepper powder as per your choice. So glad to have stumbled upon your blog. The shorba looks so wonderful and healthy. Hi, will omitting mint leaves change the taste a lot? I am going to try this today! 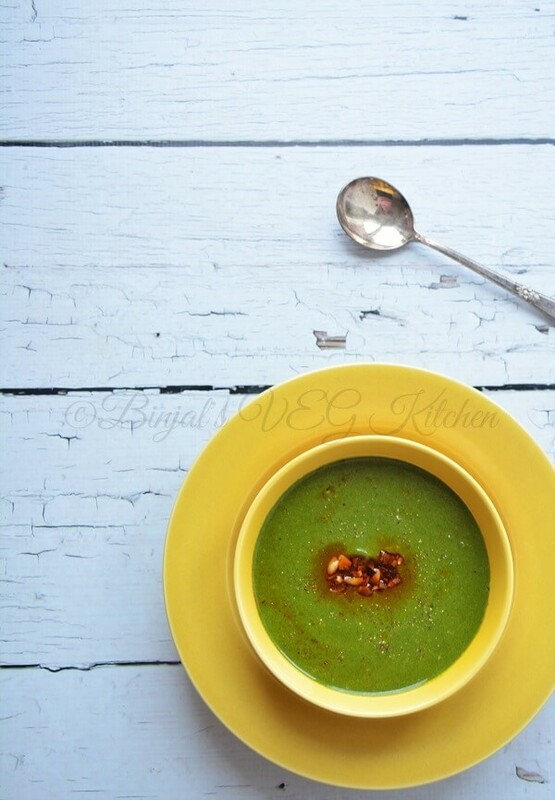 This soup looks divine!! LOVE the green color of it! This soup looks fantastic. Your photos are very enticing. I will give this a try. I always order spinach dishes when we go out for Indian but have never tried one at home. Maybe this is a sign. I love the bowl it is served in. This soup looks deliciously creamy. I just love the look of this soup. The colour is beautiful. It’s easy to veganize too by using plant based milk…bonus! I can almost smell the aroma of all those fragrant spices. Love your step-by-step photos. Will definitely add to my list of soups to try. Yum! 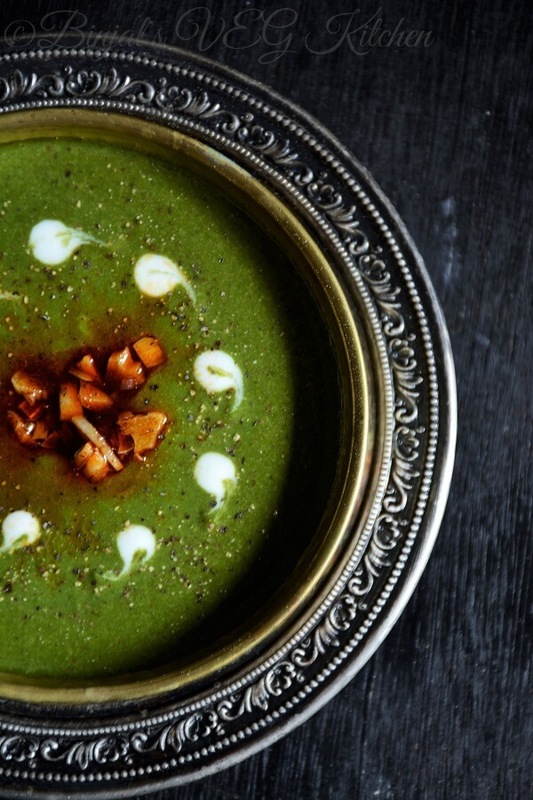 Never had a spinach soup, but wow it sounds incredible! Very nice recipe Binjal. Love the colors and all the pics are beautiful.